Easy to make chimichanga recipe that can be made ahead! Your whole family will love this one and you’ll like being able to have a meal ready to go at all times. I have entered the “my kids eat everything all day long” phase. Well I did awhile ago. They are teens and a tween. They are never not starving. I’m always on the hunt for something to make that is easy and tastes good, that will get their 2 thumbs up. Recently I bought frozen chimichangas at the store. They are quick and expensive. But I thought I could make some that would taste better and not be full of all the junk. So I did. May I present – make ahead freezer Baked Beef Chimichanga recipe? Yum. These are so ridiculously easy to put together. You don’t need many ingredients and it’s a pretty good base to use and substitute in your favorites. If you want to add chicken instead of beef, go for it. 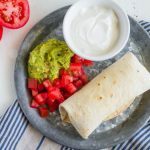 My kids love that they can add whatever extras they want on them – sour cream, cheese, guacamole and more. Some of my kids love extra cheese, I have one who doesn’t. One doesn’t like tomatoes. The beauty of recipes like this is that the base recipe is great and then they can customize it. Lots of people get chimichangas mixed up with burritos. They are both tortillas wrapped with filling. Most chimichangas are deep fried. This version is closer to a burrito because it’s not deep fried. But it is baked…so I guess you could say it’s a healthier version of a chimichanga. It would be awesome to use the air fryer to heat them up. 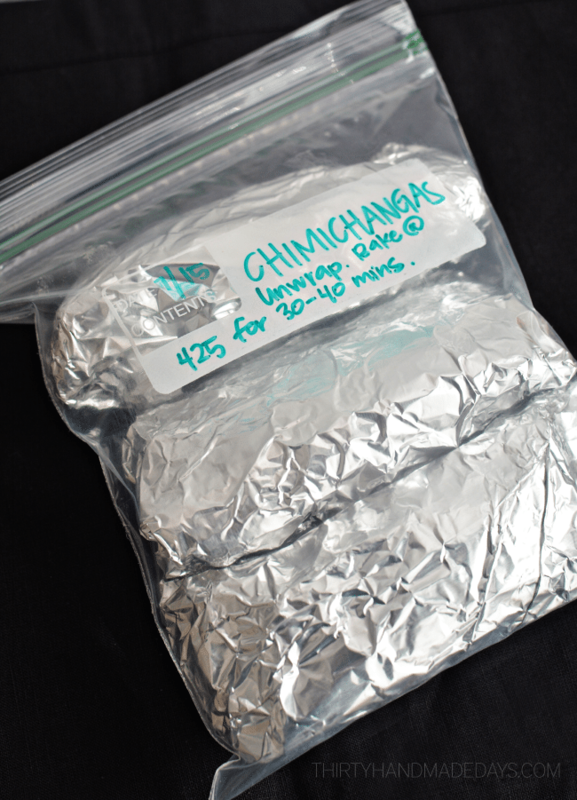 Once you put the chimichanga recipe together, wrap some up in tin foil and put them in a freezer bag. Label the bags with the instructions and the date. You do not need to bake them before wrapping them up. Make sure to eat them before 2 months. 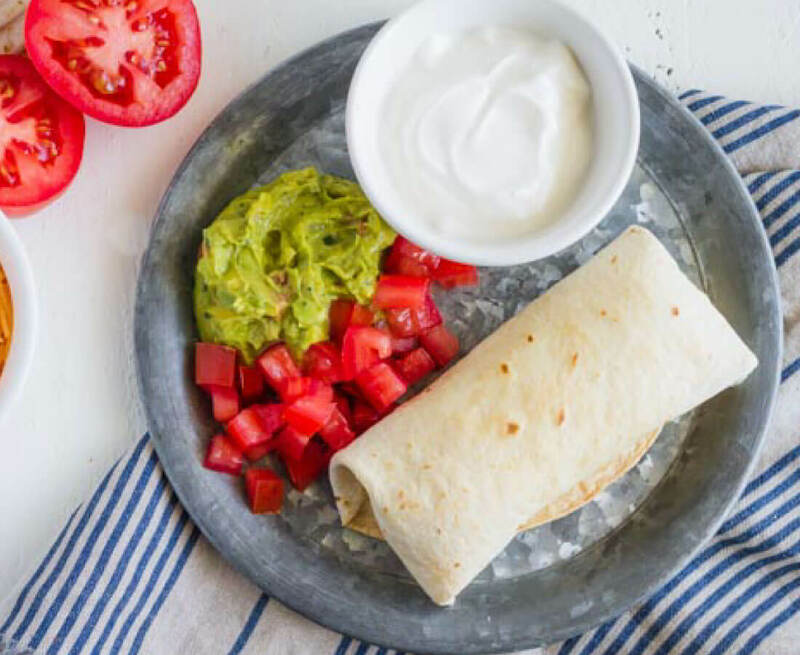 If you love this easy chimichanga recipe, you’re going to love these other dinner recipes. Please click each link below to find the easy, printable recipe! If you love this Chimichanga Recipe as much as I do, please write a five star review, and be sure to help me share on Facebook and Pinterest! 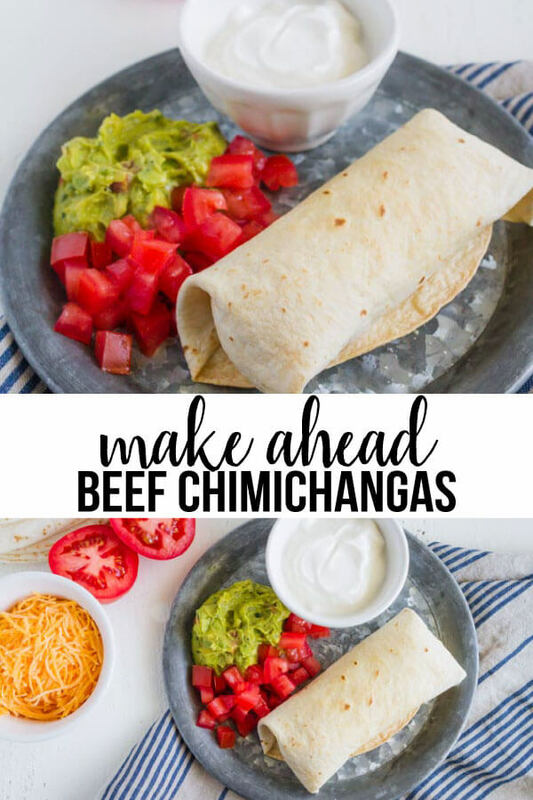 Your whole family will love this Make Ahead Beef Chimichanga Recipe and you'll like being able to have a meal ready to go at all times! Saute onion and add ground beef in a skillet. Cook until no longer pink (approx 7-10 mins). Take off heat and drain. Stir in refried beans, salsa and cheese after cool for a minute. Melt butter and brush on tortillas, both sides. Wax paper can be used for less mess. Spoon about 1/4 c. of beef mix into the center of the tortilla. 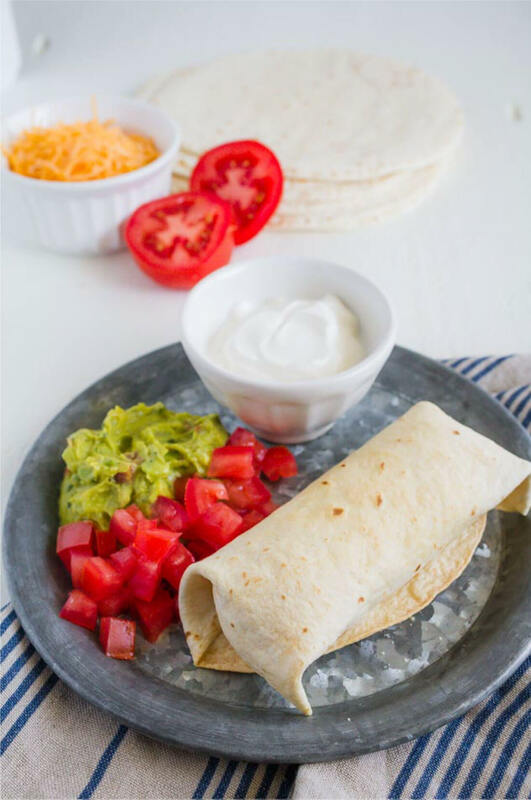 Fold sides over tortilla, like a burrito. Make sure to space them out so they are not touching. Bake for 5-7 minutes per side or until golden brown. Optional - sprinkle with additional cheese and return to oven to melt cheese (watch closely to avoid burning them). Serve with favorite toppings - Sour cream, lettuce, olives, additional cheese, tomatoes, guacamole, etc. I am happy to say that my 9 year old exclaimed this his new favorite meal. He said “Mom it tops Dr. Pepper Chicken and you know how much I love that! !” He’s the baker/chef in our house so can be pretty particular sometimes. He’ll tell me something needs “a little garlic” or “it tastes great but I think it needs…________” With this one, he was in heaven from bite one. Yay! These look SO good! I’m definitely going to have to make some! Do you think these could be baked and then frozen so they could be heated in a microwave for lunch?